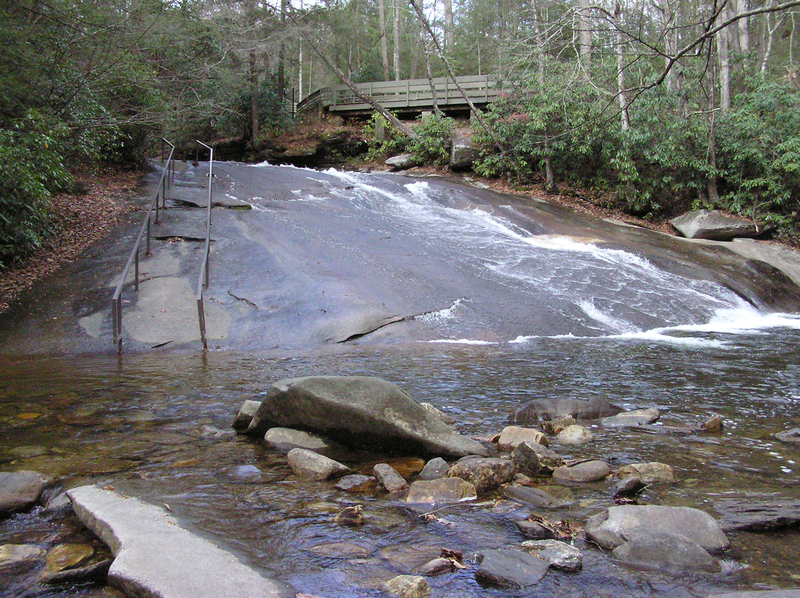 Sliding Rock is a 60-foot slide waterfall in Western North Carolina, located near Brevard in Pisgah National Forest; so named because visitors can slide all the way down the waterfall into the plunge pool below. To get to the falls, travel north from the intersection of U.S. Highway 276 and U.S. Highway 64, approximately 7.7 miles. En route, you will pass Looking Glass Falls and the parking area for Moore Cove Falls. The area has been developed by the US Forest Service into a popular recreation area. Parking is available in a large lot above the rock and beside U.S. Highway 276. In the popular summer months, a parking fee is charged and lifeguards are on duty. In cases of high water or lightning, the slide will be closed by the lifeguards.